H.R. McMaster in Munich on Saturday. 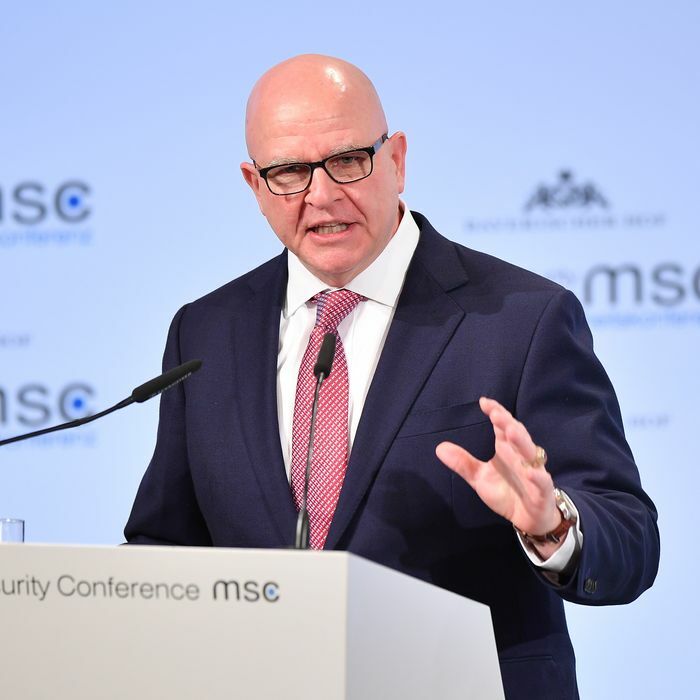 McMaster has expressed his confidence in the Russian election-meddling allegations before, and his new comments on Saturday were once again at odds with the views of his boss. President Trump has repeatedly sought to discredit the notion that Russia interfered in the election, particularly on his behalf, referring to the claim of interference as a “hoax.” Trump even went so far as to say that he believed Russian president Vladimir Putin’s claim of innocence regarding the matter when the two leaders met at a summit in Asia last fall, and the president continues to insist that there was no collusion between members of the Trump campaign and Russian agents. On Friday, Trump was reportedly elated after being briefed on the new Russia indictment, seeing the bad-for-America news as good news for his no-collusion claim. That’s because the indictment says that the Russian agents posed as Americans when they interacted with “unwitting” Trump campaign officials, and does not explicitly make any allegations of collusion, suggesting that no Trump officials knowingly helped the Russian operatives referenced in the indictment. The indictment also didn’t say that the Russian efforts succeeded in having an effect on the outcome of the election. Trump seemed to celebrate these points in a tweet on Friday, but just because the indictment didn’t mention collusion doesn’t mean it didn’t happen.